Six works by local artist Kathryn Ensall painted in oil in 1997. Enlarged and printed on vinyl they adorn the end wall of Redbrick mill, Batley Carr just outside Dewsbury. The original oils are held in the permanent collection of Kirklees Council. 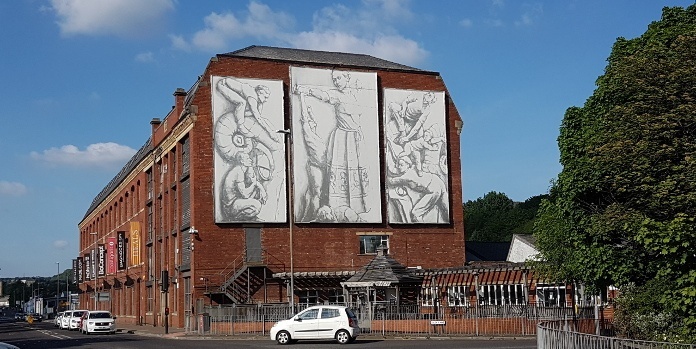 The Dewsbury area has a number of artists, sculptors and other creative arts as well as local centres focused on particular cultural activities. Melanie Wilks is a sculptor living and working in Dewsbury who specialises in the carving of stone using hand held tools. She produces drawings for her sculpture and uses them as a guide while not allowing the final work to be limited by her initial intentions. Melanie has been producing sculptures in stone for more than 25 years while also working to commission, exhibiting and running training workshops both in her own studio in Dewsbury and elsewhere. The image is of The Miner, one of a pair titled 'The Miner and the Weaver" located outside the Town Hall, Queen Street, Morley. Her stone sculptures can be seen in towns, parks and public spaces in and around Yorkshire and North Lincolnshire. Former maintenance engineer in the textile industry, Graham Jenkinson uses the same tools and equipment to inject scrap metal, old tools and redundant machinery with a new lease of life. Intending to make people smile by imbuing his work with quirky characteristics, Graham has exhibited extensively as well as producing works for public display and numerous private commissions. An example of Graham's work: 'Ferrous Ballet'. Graham aims to keep the original main component identifiable within the work so that viewers can see that even discarded items have beauty, shape and form in their new incarnation. Bruce Mulcahy was born and bred in Dewsbury and continues to work here. After gaining an honours degree in Fine Art at the University of Newcastle Upon Tyne in 1978 he immediately won commissions and began painting full time. He has exhibited around the world and his work is held in collections in the UK and numerous other countries. He runs workshops, classes and demonstrations for those wishing to start or improve their painting skills. A vibrant club with over 150 members catering for both the experienced turner who may wish to develop their skills and for the complete novice. The club has a well equipped workshop which includes 16 lathes, bandsaws, sanders and a planer/thicknesser. Tuition and advice is freely available from the team leaders and the more experienced members. Note that this is a hobby club enabling members to give expression to their creative potential. They may undertake work for community groups but do not provide a commercial service. Born in Northampton but brought up in Dewsbury since he was 7 years old, Malcolm East has recorded his memories of Dewsbury in a series of works entitled; 'When I Was A Lad'. His earlier work included 'Twenty Four Hours down the Mine' about his experiences at Thornhill Colliery followed by 'Changing the Face of British Rail' when he worked for BICC on contract to British Rail. The Creative Arts Hub is an independent, self supported, artist-led initiative supporting artists in the creation and promotion of new artwork. On the Mezzanine floor of Redbrick Mill, 218 Bradford Road, Batley, WF17 6JF.